The chancellor of the University of Medeniyet [“Modernity”], M. İhsan Karaman, reacted to the Boston Gay Men’s Chorus concert in Istanbul. 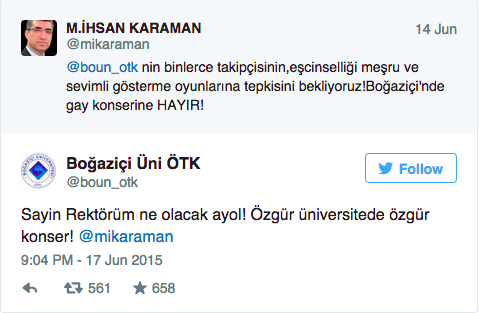 The response came from the Bosphorus University’s Council of Student Representation. Boston Gay Men’s Chorus, one of the prominent choruses in the US, was to arrive at Zorlu Performing Arts Center for a concert on 27 June , a day before the 13th LGBTI Pride Parade. Vahdet, a newspaper in Turkey, carried the concert to its headlines as “Perversion Runs Free,” in which it called for a boycott against Zorlu Holding and pointed out both Zorlu Holding and Kaos GL as targets. Consequently, ticket sales were halted. Following the cancellation of the concert, with the efforts by the Bosphorus University LGBTI Studies Club, it was announced that the concert was going to be held at Bosphorus University’s South [Main] Campus. The Boston Gay Men’s Chorus will be in Istanbul [at Bosphorus University’s Main Campus -Trans.] on Saturday June 27th at 6:30pm. The concert will be open to public and free of charge. A sound system will be set up at the 1,500-people capacity venue for those who cannot find a seat. Turkey has a history of political violence, hate crimes, and political assassinations that followed a governmental authority figure and/or mainstream media singling out a person or a group out as rightfully injurable with impunity. –Trans.